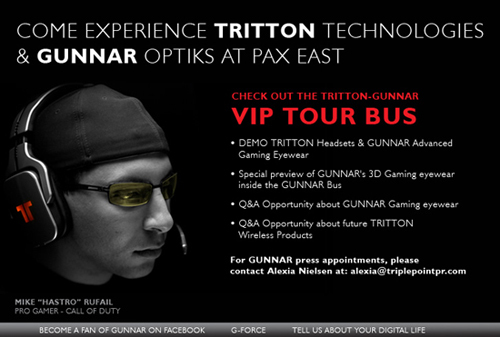 Gamers headed to PAX East 2010 in Boston next week can take the TRITTON and GUNNAR Experience to get their hands on TRITTON Headsets and GUNNAR OPTIKS. Located at Booth #1027, TRITTON and GUNNAR are giving gamers the inside look at some of the most popular accessories in video gaming. And while your at PAX East 2010, be sure to look for the DualShockers Team as we will be there all 3 days checking out everything PAX East 2010 will have to offer. Be sure to give the team a shout. See you there.